I was really disappointed in this. I love post-apocalyptic, but this is just boring. 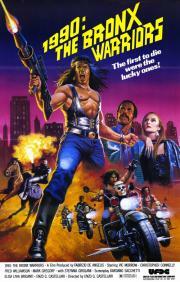 This story is simple, without being fun, and the gangs are a cheap "Warriors" rip-off. Even better than The New Barbarians, but it could've used more George Eastman. Plenty of Fred Williamson though, which is never a bad thing, plus it stars Mark Gregory with a permanent jean wedgie. Hey now, let's not all pretend this movie doesn't straight own. Too good. The mannerism here, the mise-en-scène's tidy untidiness, the stilted and clichèd dialogue, the soundtrack's governing of the editing pattern... Everything in this film has attitude. Think The Warriors directed by a mellow and half-alky Carpenter, maybe. Anyhow: Stunning. An inept mashup of Escape from New York and The Warriors. The dialogue is astoundingly bad, and like many awful films there are a lot of drawn out establishing shots that establish things that were already well-established. It borders on being so bad that it's good, especially with the insane costumes, but it doesn't quite make it. Sad and not really much fun at all. After seeing how bad the sequel was via MST3K, I had to check out the original. Amazingly, Escape from the Bronx is actually an improvement on this. At least Trash doesn't have hilariously corny philosophical monologues in that. 10 points for the pimp king though!